All Web addresses mentioned were functional as of 10-21-16. From the Cumberland Gap to the Atlantic Ocean, this is Virginia Water Radio for the week of October 24, 2016. This week, we feature music about a Virginia Blue Ridge mountain river noted for exceptional natural qualities and a historical ownership conflict. Have a listen for about 25 seconds. You’ve been listening to part of “Hazel River,” by Timothy Seaman with Henry Smith and Paulette Murphy, on the 1997 album “Here on This Ridge,” from Pine Wind Music. The album was a project celebrating Shenandoah National Park and the Blue Ridge’s people, lands, and waters. According to Mr. Seaman, the tune commemorates a 1977 hike downstream along the Hazel River’s headwaters, and the music reflects that experience by moving down through several keys. The Hazel River begins on the Blue Ridge in Rappahannock County, then flows approximately 51 miles to its confluence with the Rappahannock River in Culpeper County. Along the way, its tributaries include the Hughes, Rush, and Thornton rivers. The Hazel is noted for its scenery, trout fishery and other aquatic communities, and whitewater paddling sections. Based on those qualities, the Virginia State Water Control Board designated a 6.5-mile section of the upper Hazel River in Rappahannock County as a Tier III/Exceptional State Water. 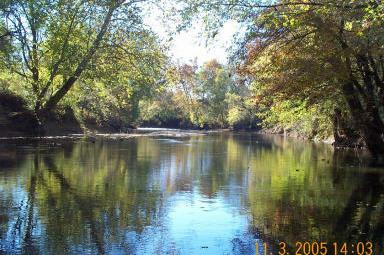 According to the Virginia Department of Environmental Quality, a Tier III designation recognizes waters with outstanding scenic beauty, exceptional aquatic communities, or superior recreational opportunities, and it prohibits any new or increased permanent wastewater discharges into such waters from identifiable point sources. The Hazel’s designation, as well as the October 2016 removal from the river of part of the 150-year-old Monumental Mills dam in Culpeper County, was complicated by king’s grant claims—that is, claims from some streamside landowners that specific grants during the colonial period give the landowners possession of the streambed and the right to prohibit wading and fishing. “Hazel River” and “Here on this Ridge” are copyright Timothy Seaman and Pine Wind Music, used with permission. More information about Mr. Seaman is available online at http://www.timothyseaman.com/. This episode updates the “Water Sounds and Music” segment of Episode 39 (10-25-10). “Hazel River” was also featured in Virginia Water Radio EP209 – 4/14/14. Upper photo: Hazel River near Shenandoah National Park boundary, Nov. 4, 2005. Middle photo: Hazel River in Rappahannock County, Va., outside of national park, Nov. 4, 2005. Lower photo: Hazel River about five miles upstream of confluence with Rappahannock River in Culpeper County, Va., Nov. 3, 2005. All photos from Virginia Department of Environmental Quality, “Summary Report for the Hazel River Staff Site Visit November 3 & 4, 2005,” PDF available online at http://www.deq.virginia.gov/Programs/Water/WaterQualityInformationTMDLs/WaterQualityStandards/ExceptionalStateWaters(TierIII).aspx (scroll down to “Shenandoah National Park Region/Hazel River/Site Report”). Following is a description of the upper Hazel River in Rappahannock County, Va., of which an approximately 6.5-mile segment was designated as a Virginia Exceptional State Water, effective in August 2008. The description is an excerpt from Virginia Department of Environmental Quality, “Summary Report for the Hazel River Staff Site Visit November 3 & 4, 2005,” PDF available online at http://www.deq.virginia.gov/Programs/Water/WaterQualityInformationTMDLs/WaterQualityStandards/ExceptionalStateWaters(TierIII).aspx (scroll down to “Shenandoah National Park Region/Hazel River/Site Report”). 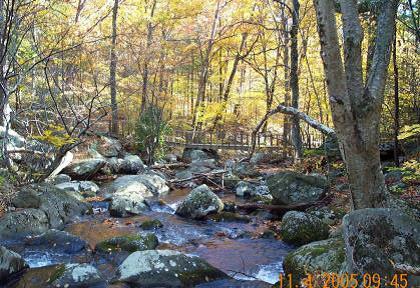 “The upper segment of the river within the Shenandoah National Park is a coldwater-habitat, headwater stream with a steep gradient, and the surrounding area is heavily forested. 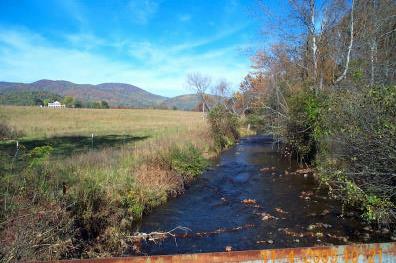 The Hazel River is classified by the Department of Game and Inland Fisheries as a Class II wild trout stream from its headwaters downstream through most of Rappahannock County and, according to Exceptional State Waters guidance, satisfies the eligibility criteria of possessing an exceptional aquatic community. ...The streambed is dominated by boulder and cobble substrate and is characterized by numerous plunge pools that provide excellent habitat for native brook trout. ...The benthic macroinvertebrate community that was observed appeared to be what would be expected to inhabit a coldwater mountain stream, consisting of stonefly, mayfly, and caddisfly species. The environmental setting, recreational opportunities, and aquatic communities all appear to be of exceptional quality. “Shortly after the Hazel River exits the national park, it may best be described as a transition from a coldwater fishery to a warmwater fishery. Though the terrain is still somewhat mountainous, the gradient becomes less steep and the substrate becomes mostly cobble, gravel, and sand with occasional bedrock outcroppings. Most segments of the river observed had adequate riparian buffer zones though others had pasture land directly abutting the river without the benefit of riparian buffers. A cursory benthic survey was done and caddisfly, mayfly, and stonefly species were noted. “Access to the river outside of the park is difficult unless one owns land on the river or has landowner permission to access the river through private property. Bridges provide limited access. Of the five or so bridges within this segment, only two provided what may be considered reasonable access for a canoe or kayak. Canoeing or kayaking the majority of this segment would probably only be feasible during periods of high flow. It should be noted that a number of the properties along the length of the Hazel River are claimed to be King’s Grant properties and as such landownership extends to the riverbed and the landowner is in control of fishing rights. American Whitewater, “Hughes and Hazel, Virginia, US—SR 603 to Rt. 522 Bridge,” online at https://www.americanwhitewater.org/content/River/detail/id/1944/. Beau Beasley, “Anglers across nation watching VA Crown Grant case,” Bay Journal, 7/1/02. Engineering Concepts, Inc., “Upper Hazel River Bacteria Total Maximum Daily Load Plan Technical Report,” submitted to the Virginia Department of Environmental Quality, June 2009, available online (as PDF) at http://www.rrregion.org/pdf/publications/environment/tmdl/implementation/Hazel_IP_TechnicalPlan.pdf. Fred Fox, Trout Unlimited/Rapidan Chapter, “Hazel River” (May 9, 2011), online at http://www.rapidantu.org/2011/05/09/hazel-river/. Donnie Johnston, Emotions surface at river meeting, Fredericksburg Free Lance-Star, 3/28/07. Donnie Johnston, Hazel River flows free after Culpeper dam is breached, Culpeper Star-Exponent, 10/6/16. Virginia Department of Environmental Quality, “Exceptional State Waters—Tier III,” http://www.deq.virginia.gov/Programs/Water/WaterQualityInformationTMDLs/WaterQualityStandards/ExceptionalStateWaters(TierIII).aspx. College of William and Mary Department of Geology, “The Geology of Virginia/Hydrology,” online at http://geology.blogs.wm.edu/. National Park Service Web site, “Shenandoah National Park-Virginia,” online at http://www.nps.gov/shen/index.htm. Rappahannock-Rapidan Regional Commission, “Upper Rappahannock River Basin TMDL Study,” online at http://www.rrregion.org/rappbasin.html. U.S. Environmental Protection Agency (EPA), “Surf Your Watershed” Web site, at http://cfpub.epa.gov/surf/huc.cfm?huc_code=02080103 for the Rapidan-Upper Rappahannock watershed. William E. Cox., “Public Recreational Rights on Virginia’s Inland Streams,” Virginia Water Resources Research Center Special Report No. 10, January 1980, online at https://vtechworks.lib.vt.edu/handle/10919/49271. Susan Svrluga, Troubled waters: Landowners, angler wrangle over access to Va. river, Washington Post, 8/19/12 (regarding a court case over access on the Jackson River, a James River tributary in western Virginia). All Water Radio episodes are listed by category at the Index link above (http://www.virginiawaterradio.org/p/index.html). Please see specifically the “Rivers, Streams, and Other Surface Water” category. George Washington, Walter Johnson, and the Rappahannock River (at Fredericksburg) – Episode 304, 2/22/16. Jackson River stream rights court case -- Episode 76, 8-22-11. Air quality and water impacts in Shenandoah National Park – Episode 231, 9/15/14.